Explora exhibits at Design & Manufacturing 2012 in Montreal. 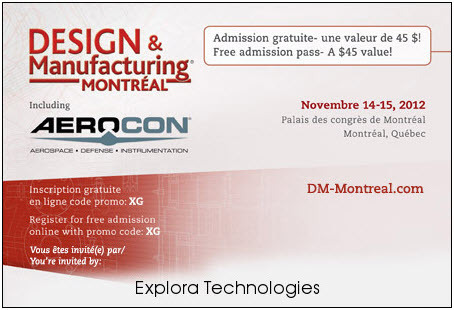 Come visit us at the Design & Manufacturing trade show in Montreal, november 14-15 2012 at Palais des Congrès. You will be able to see our last products featuring Android, Linux, some of our casings and discuss with our people. Simply click on the electronic invitation here to visit the web site where you will find detailed information and an easy online registration which allows you a free admission by using the promotional code: XG. You can also print this invitation, for registration on site. Explora Technologies is a product design and development company specialized in portable and rugged electronic devices. This company offers its services in electronic design, software development and industrial design. Explora is known for its expertise, rigor, flexibility, and its reliable processes for the conception of high quality industrial and consumer products, delivered on time, with respect of its commitments to their clients. For further information, visit: www.explora-tech.com or contact them at 418-658-5556, info@explora-tech.com. ©2012 Explora Technologies. Quebec City, Canada. All Rights Reserved.